FOO FIGHTERS is the name given to the general body of spherical, circular, disc-like, or wedged shaped "bogies," sometimes seeming to glow, shine, or reflect a high degree of illumination seen mostly by World War II pilots or flight crews. They usually paralleled or followed aircraft and were seen by aviators on all sides of the action, being reported by American, British, German and Japanese crews. No Foo Fighter was known or reported to have made or attempted any sort of contact, interaction or attack. They were known, however, for their high rate of speed and agility, being much faster than any known aircraft at the time as well as being extremely maneuverable, often exhibiting highly unconventional abilities such as instantaneous acceleration and deceleration, rapid climbing and descent, and hovering in place. In today's world a Foo Fighter would be called a UFO, an Unidentified Flying Object, of which, by all accounts, Foo Fighters were. Some descriptions such as "glowing balls of light" or "spherical fire" do not fit the conventional image of UFOs, but the disc and wedge shaped objects do --- as does the unconventional maneuverability. Both those aspects, disc or wedge shape and unconventional maneuverability, have been attributed to many UFO or Flying Saucer accounts, but most especially so to one of the most high profile ones, the so-called Roswell UFO, wherein an object of unknown nature broke up over the barren ranchland near Roswell, New Mexico, late one night in July, 1947. Although the Roswell Incident was originally reported in the local paper within a few days of the crash by The Roswell Daily Record as being a flying saucer or a flying disc, the main body of the object was reported by some eyewitnesses as being wedge or delta shaped. William Curry Holden, an archaeologist, reportedly stumbled across the downed craft early in the morning following the crash, one of the first to see it, and described it as "as looking like a crashed airplane without wings with a flat fuselage" with some reports implying the fuselage had a definite delta or wedge shape to it. It must be stated in contrast, however, that another archaeologist, William Lawrence Campbell, known as Cactus Jack, albeit not nearly so high ranking or reputable in the field as Holden and classified by many as not much more than a Pothunter --- but who had nevertheless seen the aerial apparitions called Foo Fighters during World War II first hand himself --- reported being "out there when the spaceship came down" and seeing a "round object but not real big." England entered the war long before the U.S. What became known as Foo Fighters were reported by the British as early as September 1941, with regular sightings by all sides continuing, except for a several month lull in 1943, throughout the war. 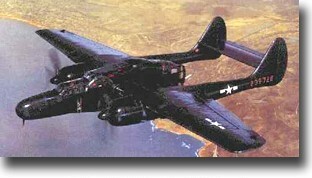 On the U.S. side, although sightings occurred periodically before the deployment of P-61 Black Widows in Europe, it was the night fighter pilots of Black Widows that were among the first American military men to regularly report seeing Foo Fighters, saying "unknown objects" followed or paralleled their planes and glowed in the dark. It is said the night fighters shot at them a few times, but the fire was never returned. It is also thought it was the pilots of the Black Widows that finally gave the UFOs the nickname that stuck: "Foo-Fighters," a term picked up from the then popular Smokey Stover comic strip. Interestingly enough, with all the sightings and reports, and all the gun cameras and high altitude photographs, no truly GOOD pictures of Foo Fighters from the period have surfaced. 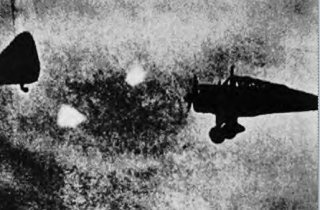 as seen with Foo Fighter "Bogies"
The photo at the right showing what is alleged to be both a wedge-shaped and spherical-shaped Foo Fighter together with two Japanese planes is perhaps the most often depicted when citing Foo Fighters. The photo, from the 1975 photo-history by G. De Turris & S. Fusco, "Obiettivo sugli UFO," has both its supporters and detractors. If the picture was taken by Japanese photographers, which it surely must have been, it would seem, except for a quest for truth, they would have no vested interest in continuing or falsely perpetrating a myth. If, however, the photo was altered after the fact that would be another story. The question to be asked, if you were going to alter a picture, why start with such a dumb photograph when there must be thousands upon thousands of other pictures one could select? On July 16, 1945 at 5:29:45 a.m. Mountain War Time, at the Trinity Site, White Sands, New Mexico, somewhat west of the city of Roswell and long before it became famous for the Roswell UFO the first nuclear explosive device on Earth was set off. 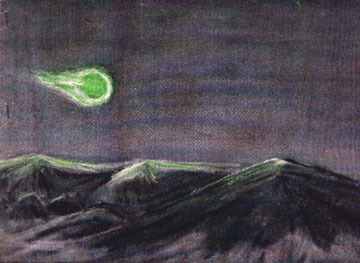 Shortly after that test and especially so after the war the general New Mexico area was inundated by "green fireballs." Theoreticians in the Air Force believed the fireballs were propelled objects and not natural phenomena, bearing a very close similarity to Foo Fighters. Because of same the noted astronomer and meteorite expert Dr. Lincoln La Paz was called in to investigate. La Paz, in agreement with the theoreticians, stated that normal fireballs (meteors) are seldom if ever green, their trajectory is forced on them by gravity, and leave meteorites when they plunge to Earth. The green fireballs sighted over New Mexico did none of these things. Neither did they appear to La Paz to be electrostatic phenomena as they moved too regularly and too fast. A logical explanation was not proffered with respect to the origin of Green Fireballs, it was however generally concluded that the phenomenon existed and should be studied scientifically until these occurrences can be satisfactorily explained. Further, that the continued occurrence of unexplained phenomena of this nature in the vicinity of classified installations is a cause for concern. Not all aerial objects otherwise left unidentified in World War II were Foo Fighters or unexplained phenomena such as Green Fireballs. Nor were they necessarily small in size either. Some were downright gigantic. The most infamous was an object seen by literally thousands of people along the coast of California barely three months into the war. 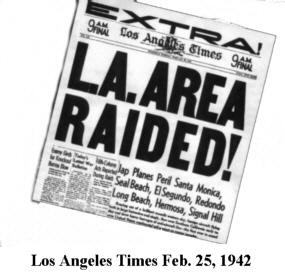 The UFO over Los Angeles is mostly forgotten now, but during the early morning hours of February 25, 1942 the whole city and surrounding communities were in an uproar as thousands of rounds of anti aircraft shells were expended to pull down whatever it was out of the sky that night. The slow moving object, said to be as big or bigger than a Zeppelin, was caught in the glare of the searchlights from Santa Monica to Long Beach and seemed impervious to the constant barrage of shells. It eventually disappeared out over the Pacific after cruising along the coast and cutting inland for a while. The huge object was never clearly explained and was basically hushed up without response from the authorities. Speaking of Zeppelins, during World War I, on the night of January 19, 1915 two German Navy Zeppelins carried out the first successful bombing run against British soil. One year later, although not exactly a Foo Fighter in the World War II classical sense, the FIRST sighting of a UFO from a powered aircraft EVER as well as the first firing on a UFO from the air occurred over England. David Clarke and Andy Roberts write in their book OUT OF THE SHADOWS: UFOs, the Establishment and the Official Cover-up (London: Piatkus, 2002) that early in January 1916 at the fighter aerodrome at Rochford in Essex outside London around 8:45 PM Flight Sub-Lieutenant J.E. Morgan arose for an anti-Zeppelin patrol in his BE2c fighter. When Morgan reached 5,000 feet he saw a little above and slightly ahead to the right about 100 feet away what he described as "a row of what appeared to be lighted windows which looked something like a railway carriage with the blinds drawn." Believing that he had flown directly into the path of an oncoming Zeppelin in the act of preparing to attack London, Morgan drew his service pistol and fired several times in the direction of the "railway carriage." Immediately, "the lights alongside rose rapidly" and disappeared into the night sky, so rapidly in fact that Morgan believed his own aircraft had gone into a dive. Overcorrecting his actually not out of control aircraft he crashed into Thameshaven Marshes. A full account of Morgan's sighting, dubbed "an encounter with a phantom airship" appears in German Air Raids on Great Britain 1914-1918 by Captain Joseph Morris published in 1925. The book was compiled from then classified Air Ministry records, and Morris refers directly to the airman's report filed with the War Office. Extensive searches of the Royal Flying Corps records at the Public Record Office have failed to locate Morgan's original report. The station log from Rochford aerodrome does give brief details of Morgan's flight with the addition of the word "Zepp" which shows he did have an encounter with something he took to be an enemy airship. Morgan's report is NOT included in the official account of the January 31, 1916 raid published by the War Office at the end of the conflict, which charts the movements of the Zeppelin raiders and the attempts by British fliers to intercept them in great detail. There is, however, additional support for the claim that an airborne object of some kind was present over southeastern England during the air raid. Another RFC pilot by the name of McClelland, reported seeing what he described as "a Zeppelin" caught briefly in the glare of searchlights above London at 9 pm, 15 minutes after Morgan's encounter. There is a rich vein of declassified material respecting "Foo-Fighters". Very many reports have been released by the US and British archives. But for the most part they all have the same failing: they have been heavily censored. If we were dealing here with a natural phenomenon such as Weather Plasma, these reports would not have required the savage deletions to which they have been subjected. A deletion in an official document is made to protect the issuing authority in some way. It may be an agent's name: it may be something underhanded that was done: it may be information respecting a weapon which the authority does not wish to be made public. Both the US and British authorities are agreed in their published summaries regarding the "foo-fighter" phenomenon that the objects were "invulnerable". No method could be found to shoot one down. If they knew that, somebody at some stage had to have made the attempt to do so. One searches in vain through hundreds of documents with their extensive deletions to discover the answer to a single interesting question: When a "foo-fighter" was fired upon by an aircraft�s cannons, what happened to the bullets? Did they seem to go straight through the thing, or were they rebounded or deflected by some kind of force field? (i) German scientists developed an anti-aircraft device which remains top secret because it had one singular property unknown to modern Western science. (ii) German scientists postwar built full scale crewed aircraft at clandestine locations and these aircraft shared the singular property of the foo-fighter unknown to modern science. A foo-fighter was a luminous rounded flying object observed and reported by hundreds of Allied aircrew between September 1943 and March 1945 over the Rhine. A lesser number of reports were filed by crews overflying Japanese controlled territory. 302 sightings were made by 140 crews of US XXI Bomber Command alone. [NARA Intelligence Publications, Air Int Report Volume 1, No 8, 26, IV.1945] and these may be taken as a cross-section sample of the whole. The "fireballs" were mostly described as around "six inches in diameter", "the size of a soccer ball", "about the size of a basketball". The colour of the illumination was described as a very strong white, although reds, yellows and ambers are also mentioned. Occasionally Allied aircrew reported that the objects fell out of control and were observed to crash and explode on the ground. This would confirm that they were material creations of human technology. One RAF pilot and navigator, and one USAF air gunner, reported that a fireball transformed suddenly into a small aircraft "with a navigation lamp burning on the left wingtip". 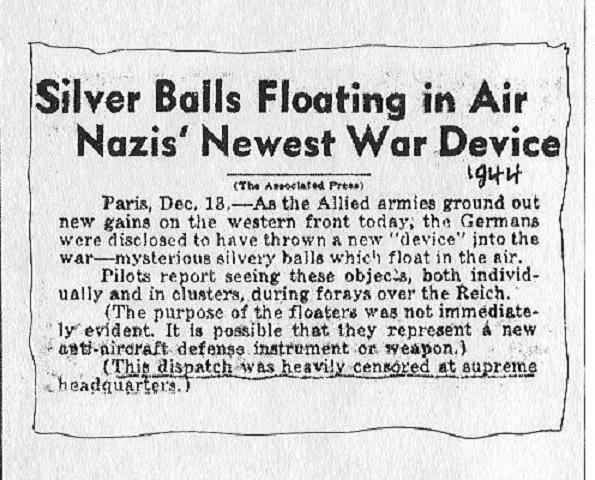 These aberrations lead us to suspect that the "foo-fighters" were a German aerial device with a singular propensity. The search now widens in pursuit of a German model aircraft. Dr Renato Vesco was an Italian scientist who worked on secret weapons projects at Lake Garda. In his book "Intercept But Don�t Shoot" [Grove Press, 1971] he described a German remote-controlled anti-aircraft device with a homing facility. It was known as Kugelblitz. This word means "ball-lightning" which is a plasmoid. Vesco never saw a Kugelblitz for himself, but it was common talk amongst his scientific colleagues at Lake Garda. In his book he tries to work out how the thing worked. Since an anti-aircraft device just goes up and explodes, he could not understand why the Kugelblitz needed a dual propulsion system. There was a hydrogen peroxide engine, and then there was an ion-mercury plasma engine, and for the life of him he did not know what the second one was for. Was there a German anti-aircraft device known as Kugelblitz? There are two known declassified documents which describe the machine. The British report appears in the BIOS intelligence publications. From this, we know that the Kugelblitz was an anti-aircraft device, had a hydrogen peroxide system. So, what of its speed, rate of climb, warhead, range, hull form? Mind your own business. The American report was obtained recently under the Freedom of Information Act. The few patches not blacked out tell us that the Kugelblitz was an anti-aircraft weapon due to enter service in March 1945. Were the Germans working on an ion mercury plasma? The highest known priority for any project in the Third Reich was "Kriegsentscheidend" - decisive for the war. Only one single project was awarded this category under the protocol of 21 July 1942 - the AEG electrical giant's project Chatite Anlage Directed by Dr Richard Kr�mer, it involved the use of tremendous voltages in a Plasma Physics project "which will last until at least the end of the war". It is known that this project involved spinning containers of mercury at fantastic speeds within a ceramic bell-shaped object. Another scientist, Kurt Debus, elaborated the theory known as Separation of Magnetic Fields. [See certificates issued 22 April 1943 and other documents in: NARA/RG Foreign Scientist Case Files K Debus, Box 28, US NAT Archive, College Park]. The foo-fighters were creations of German technology and were remote-controlled from German occupied territory. It is generally known in Germany that the aircraft had a tortoise shape and probably resembled a midget Me 163. At some point in its ascent the hydrogen peroxide engine cut out and the ion mercury plasma engine cut in and the craft moved into another magnetic field where, as we have seen, it lost its distinctive aircraft shape and became a fireball to the human eye. In Magnetic Field II it was invulnerable. It then homed onto an Allied aircraft but did nothing. The point was of course, that the craft was invulnerable in Magnetic Field II, but it worked both ways, and Allied aircraft were invulnerable to it. In all probability, German scientists had not figured out at that stage how to get the foo-fighter out of Magnetic Field II into Magnetic Field I at altitude where it could explode alongside the Allied aircraft. If this could have been achieved, the Reich would have regained air supremacy, for this was an anti-aircraft weapon with a 100% success rate at last - it would have exploded five meters from the aircraft fuselage giving the B-29 or Lancaster no chance of survival whatever.